Water in Arizona. Yes, the word water is going to be getting more and more important as the Western part of the U.S. is in a big draught. We forget how important clean drinkable water is, or any kind of water, until there is a limited source or none at all. Good Neighbor Insurance brokerage firm resides in Arizona. We have been here since 1997 and love this great State! Our GNI Team each morning enjoy a quick 2-3 minute huddle meeting. We all are standing up in the kitchen area of the office and connect. Sometimes we decide on a word and all of us share ideas about that word. Well, this week we decided to chat about “water” and had two of our Team members write down their thoughts. I even did not know some of these things! * Arizonans have a fascination with rain! Only in Arizona do kids and adults get so excited when it rains even just a few drops. Someone will shout “Rain!” and everyone is running to windows or opening a door to step outside to see the rain. * The reason for a lot of flooding in Arizona is because of the hard packed soil baked by the sun. It is unable to absorb the sudden heavy downbursts of rain in the summer. * Water, captured by dams or diverted by canals, has given life to an arid desert. Where once cacti and sparse vegetation grew now orange groves, cotton fields, golf courses and urban parks with lakes have taken their place. That is why so many visitors love Arizona from September through April. * Nothing quenches the thirst like a cold glass of water on a very hot summer’s day in Arizona. Of course a dip in a swimming pool helps, too! * Where else but Phoenix, Arizona do they build a wave pool! Big Surf Waterpark opened in October 1969 and is home to America’s original wave pool. It holds 2.5 million gallons of water. * Arizona doesn’t get much rain! While the state wide average is a little under two feet, the Phoenix area and the western side of the state gets less than 10 inches a year. * Phoenix was founded because of water! The Salt River goes through Phoenix and travelers searching for water found the river and decided to settle near it. To get to know our GNI Team members let’s head over here to www.gninsurance.com/meet-team-good-neighbor-insurance/. 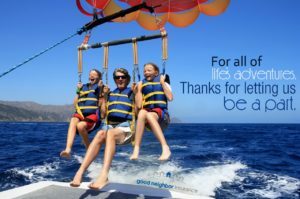 To all in Arizona and throughout the U.S. and this wonderful Globe of ours, thank you for allowing GNI to serve you on your international medical insurance cover! !